Great news to begin the week. We are very happy to share the client Feedback from one of our recent Oracle CRM On Demand #CRMOD implementations. This client is a famous Insurance and Banking firm from Australia. Thanks CRMIT for the excellent work to support the demanding requirements on this implementation of CRMoD. You were excellent communicators and your CRMoD knowledge is excellent. Excellent Job, Team CRMIT. Keep going! In the last couple of years, we have read enough about Social Networks. Some of us understood what it is all about and got in there with clear goals, many others went with the flow and became addicts. Few think it spoils their productivity and decide to keep it strictly controlled (or stop it altogether), Many others think it improves their productivity and give reasons / measures to prove it. The reality is, none of us understood the impact Social Networking has made / is making as we speak. It is so huge, practically making it impossible to even visualize. We all look at small parts of it and make our judgement, without realizing it is incomplete. This book (The Asocial Networking : Musings On The Real & Online Words By Dhiraj Kumar : Wordizen Books : 322 Pages : Price : Rs 195/-) approaches this from a different angle. The author asks us to think again about the ‘virtual network’ (or the ‘second world’) we all take for granted. Is there really another world? Are those really your friends? The constant updates you are making on the social media, does it really matter in the bigger scheme of things? Do those likes and follows and Retweets mean anything? Now, this is not a book against online world or Social Media. In fact the author gives a wonderful background about various social networks people use and how they do it. Only catch is, he tries to break the myth around these by introducing logic and rational thinking to the table, Making us think, how social these networks are, really? The book is actually a collection of 150 short articles written by Dhiraj Kumar. It talks about the Offline world, how it got impacted by the online networks, how we started sharing information, photos, videos and almost everything with our virtual “friends”, What is the psychology behind someone carefully designing their facebook homepage, how seriously privacy is viewed, what is our level or tolerance when it comes to social network related complications, how games affect our mindset, What “Likes” and “Comments” really mean, how we react differently in online / offline worlds and so on. If I list all the topics the book covers, this review will run into many pages. Nowadays we assume social networks as a granted thing. If someone is not “Online”, for all practical purposes they don’t exist. We are more connected to these virtual worlds, we want to do business online, we want to complain in social media, instead of sending a private email to the brand or the store where we bought the product, we ask for opinions / reviews from these online friends and make decisions based on this. To cut a long story short, our dependency on these social networks becomes more and more every passing minute. So it makes sense for us to stop and think about these, understand the perspective and then take a call. It doesn’t mean you will delete your facebook profile etc., after reading this book, but you will take it differently if someone likes your post, or someone doesn’t like it. Huge improvement, isn’t it? Lovely book for those addicted to Social Networks, Others will find is amusing to know that there is a world like this. Very good debut book by Dhiraj Kumar. 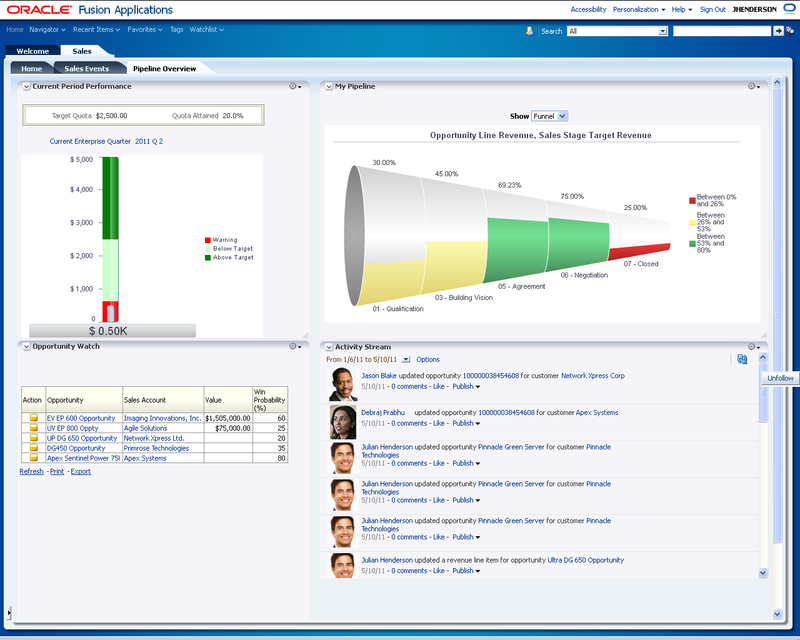 Found this treasure during a casual browse, Oracle Fusion CRM Screenshots from various modules, uploaded in High Quality by the official Oracle team themselves!